“We’re just the same, you and me” said A. I take it as a compliment, happily glossing over her thirty additional years on the planet. She has the most piercing look, she’d have been a great interrogator. Instead she is a campesina, a countrywoman. Timeless. Sturdy. Hard hands. Sitting on a stool she scoops handfuls of almonds into her apron, and shells them on a tree-trunk in front of her with a small hammer. Simultaneously inspecting it and sniffing it, it is quickly analysed and distributed to the heap on the left or the right. Top quality for eating as they are, second best to be made into turrón. 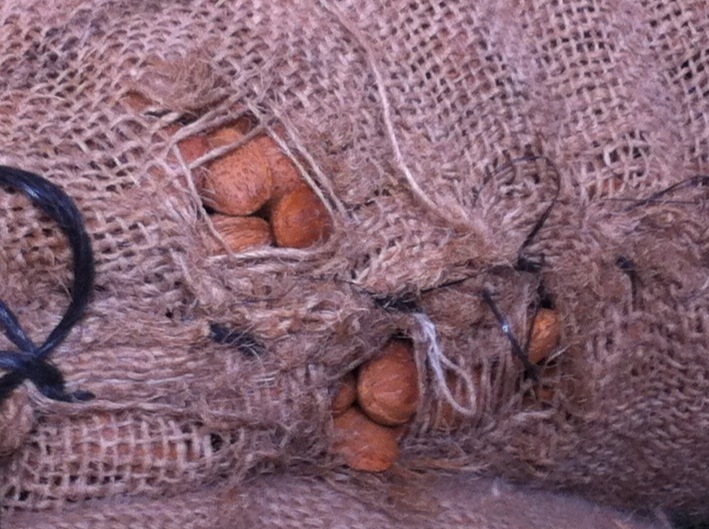 A smaller pile, the rejects, will be used at home in cooking or for eating fresh. Her life follows the same pattern, year after year. 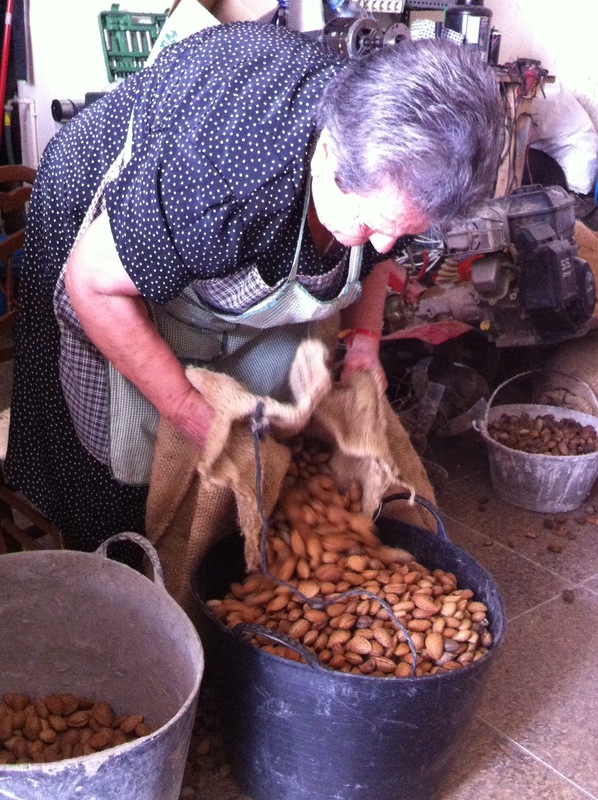 Almonds, fruit, olives, the annual killing of the pig followed by frenzied making of sausages, chorizo, morcilla. For other people, the seasons are marked by school terms or a summer holiday. For her those go by unnoticed. Her life is governed by what the land produces. She and her son and her grown-up grandsons sit in a companionable circle, shelling, bagging, loading almonds, each person knowing their task. At the end of the day she sits in her favourite chair and reaches for a book. She gets through a couple of books a week, though it wasn’t always that way. Like most Spanish people of her age, her education was patchy and interrupted. Reading, and a love of books, came later, and she is making up for lost years by reading voraciously, consuming the written word greedily. Uninterested in the superficiality of magazines, she reads the great literature of her nation, small volumes with tiny print, the brim of her hat shading the page, her gnarled brown hands resting in her lap between turning the pages with that papery whisper loved by all readers. Her family are nearby, but she is happy with her own company. She has known civil war, horror, hunger, pain. Now, long past retirement age she works long days, physical labour, and no word of complaint ever passes her lips. She radiates a serene contentment. “We’re just the same, you and me” she says, when she sees me reading. She sees straight past different nationalities, different languages, to the common humanity below. It’s more than the books, it’s the contentment. She is happy with her life, she does not seek more. She is a quiet inspiration. M is my age. Born and bred a Malagueñan, she thrives on the city life and would probably deflate like a slow puncture if uprooted and plonked down in a pueblo. “¡Guapa! ¡Inglesa! ¡Tamara!” she calls out as I pass her kiosk in a Málaga alleyway. She wants to show me the placards she has made for her latest protest. Three massive sheets of cardboard create a kind of wrap-around costume that sits over her shoulders. Roughly-drawn in a mixture of marker pen and thick paint, the main front message begins “¡Alcalde, me mata!” – Mayor, you are killing me. On the back is a list of dates – they represent the weeks this year that roadworks have blocked access to her little shop, reducing footfall. She goes most mornings to the town hall, and marches up and down shouting for an hour before removing her cardboard armour and returning to the historic centre of Málaga where she stows it behind the counter then mixes another mojito for a visiting feria-goer. Three days later, “¡Hola Inglesa! ¡Hija! ¡Tamara!” It always takes her a few goes to remember my name, but she gets there. Sometimes I have no time to stop and chat, but when I do it is always interesting. She speaks clearly enough, but faster than anyone in the known universe. Her passion, her anger, her politics, come tumbling out, words tripping over themselves in their haste. She knows my Spanish is not fluent but she is incapable of slowing down. She was banned from the town hall the day before, for throwing a piece of cardboard at the mayor’s car. But she had been in to see him the day before that and had refused to accept his placatory arm around her shoulders. She had shrugged him off and spat on the floor of his office. “¡Hijo de puta!” she had shouted at him, telling him to come and walk down the alley to see for himself how her business had been damaged. 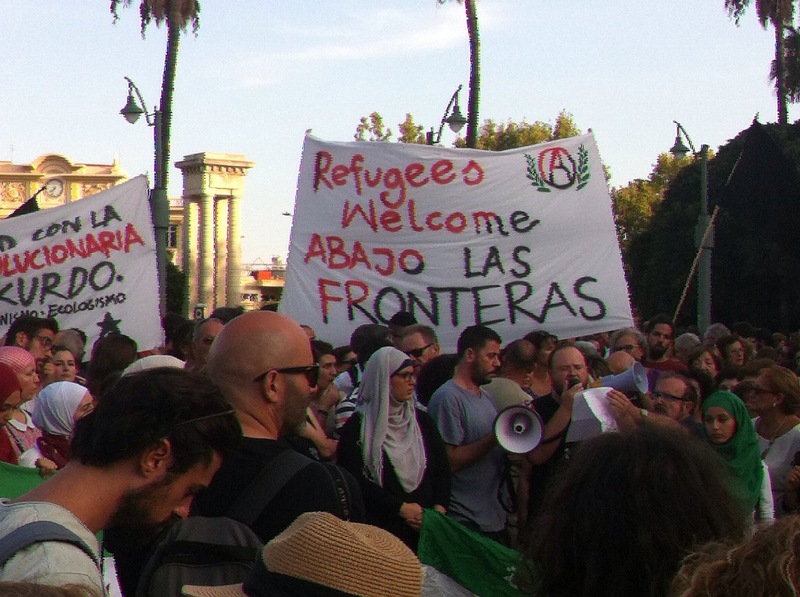 This entry was posted in Spain and tagged immigrants, Málaga, refugees, Spain by tamaraessex. Bookmark the permalink. Just a quick word to tell you I love the way you write and the stories you share! Lovely, Tamara. Beautifully written and structured. When’s the book coming out? Noooooooo! You are a “proper” writer Monica! I’m from that blogging sub-species :-). It’s out there, all in one place, and that’s enough for me. Thanks for you kind comments – much appreciated, coming from a proper writer! Thoroughly enjoyed the observations and conclusion. Thank you Tamara. Loved reading the short stories. Great observations. What a brilliant blog a joy to read, thanks for this and all the helpful info contained in your blog. Looking for a new post, and nothing doing…..😥😥 I hope you haven’t given up on the blog, I love reading your pieces. They often put into words things I feel, but can’t express! !